mommy bytes: WW - Thank you for calling. How may I direct your call? WW - Thank you for calling. How may I direct your call? Apparently I am losing control of all my digital assets as I happened to find this picture from last May and it wasn't uploaded to Flickr! 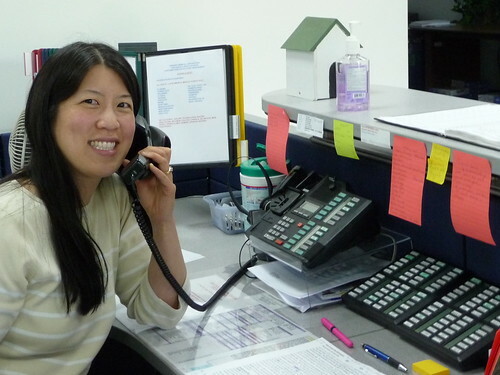 Here I am working the phones at my company's reception desk with All. Those. Buttons. Why are they paying me the big bucks to work the phones? Because all salaried employees are still taking two mandatory days off a month, including our regular receptionist. Of course the phones and the front door shouldn't go unmanned and it doesn't make sense to pay a temp to work the phones, which would defeat the purpose of saving money through unpaid days (a temp still comes in for vacation days). So they recruited several of us to cover an hour each on the receptionist's unpaid days. I figured that I've worked the phones (with no buttons) at my dorm's desk in college, so I could hack it. What I didn't figure on was juggling multiple calls, people willing to wait on hold for hours, and having real nightmares that our company was losing money because I was routing the calls to the wrong place. But hey, I'm a team player! 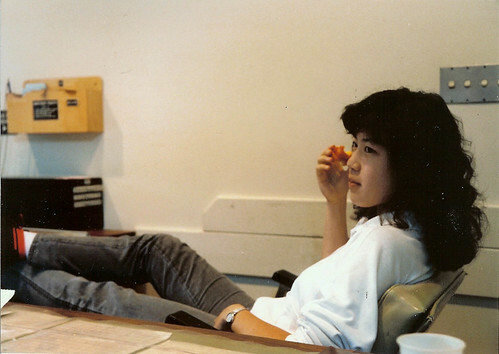 I dug up this photo of me working McCormick desk at MIT in 1987 in my BIG HAIR. Exactly the same right? Totally not wordless today, I know!